In part one of Preparing Wool for Yarn we learned how to shear sheep and get the wool cleaned and ready to card. In part two of Preparing Wool for Yarn we learned how to card and spin the wool. Now let's look at a way to dye the wool we have carded and spun! Japanese indigo is the most fascinating dye plants that I have encountered. Though indigenous to Asia, it can be grown in U.S. soil. And once grown in your garden with proper care, it has been known to reappear the following year just as a perennial plant might. There are several different kinds of indigo plants that grow in Asia and are able to be used for dyeing. Japanese indigo is just one that I know of that can easily be grown outdoors in the U.S. Japanese indigo and other indigo dye plants can be confused with Indigo Baptisia (a.k.a. false indigo), which does grow in the U.S., but does not produce a blue dye. Japanese indigo, however, produces such a brilliant blue dye, it.s almost hard to believe that it is not synthetic. Last year I was given seeds by a friend who had been growing Japanese indigo in his backyard for a few years and had started his own indigo patch by purchasing plants online. I haven.t found many places online where you can purchase plants or seeds but here are a couple I have found: www.companionplants.com and you can also find seed packets for indigo tinctorium on Ebay. Once you.ve bought the plants/seeds, you can save the seeds each year to continue producing on your own. 1) Start seeds indoors about 6-8 weeks before planting in the ground. Make sure that the soil stays moist warm while seedlings grow. 2) Once the plants have grown about 4-5 inches tall, plant in rich, aerated soil in a place that has direct sunlight. The young plants should have almost vine-like stems and some leaves growing from them. Plant about 6-12 inches apart in rows about 12 inches apart. Mulch to keep the soil damp. Japanese indigo is known to be easy to grow and can tolerate average garden conditions. It prefers rich, moist soil, so the better you treat it, the better it will grow, and the more color you will get from it if you treat it well. 3) Japanese indigo will grow about 2-3 feet high and will spread rapidly if well-taken care of. You can harvest the plant for dyeing anywhere between midsummer up until the first frost. 1) With Japanese indigo, the leaves are the part that contain the blue pigment. To start, pick about 8 oz. of indigo leaves starting from the bottom of the stem going up. This will allow you to dye 2-4 oz. of wool. 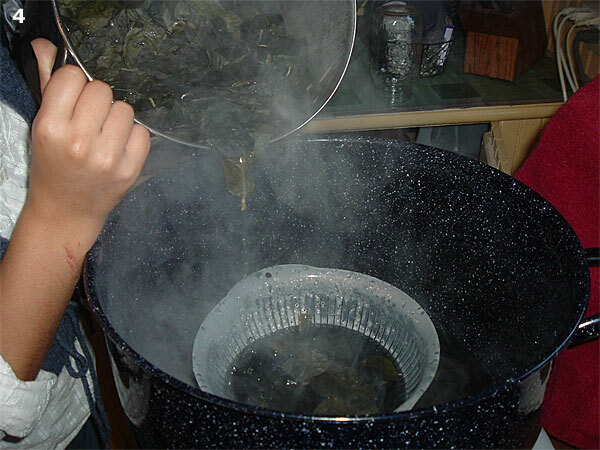 If you choose to dye more, simply multiply the amount of ounces of leaves picked. 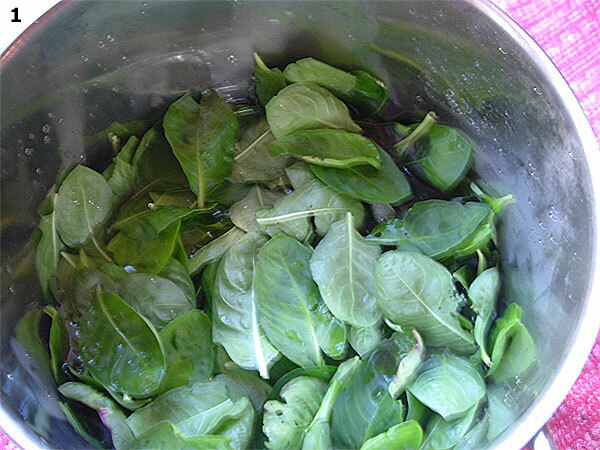 Place the leaves into a stainless steel stock pot that is designated only for dyeing or will not be used for food (see picture 1). 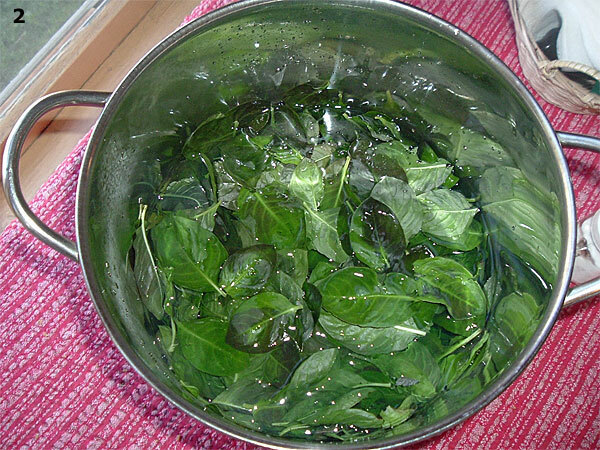 2) Add just enough water to fill the top of the leaves (see picture 2). 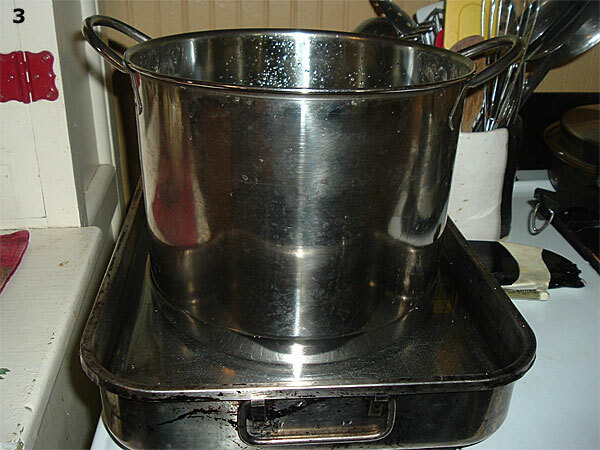 3) Cover the pot and place it into another pot or pan with warm water, like a double boiler (see picture 3). Place the two containers on the stove. Over low heat, heat the water to 160 F over the course of two hours. 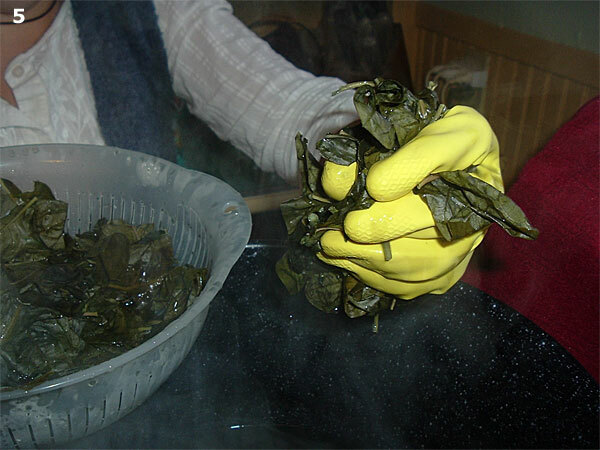 4) Once it is heated, strain the leaves from the dyebath into another pot (see picture 4)Wearing rubber gloves, squeeze the excess pigment from the leaves into the dyebath and then discard them (see picture 5). 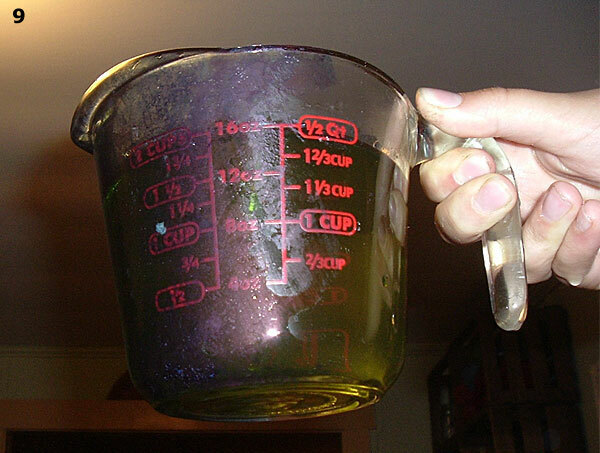 5) Add 1 Tablespoon of baking soda or ammonia to adjust the pH level. 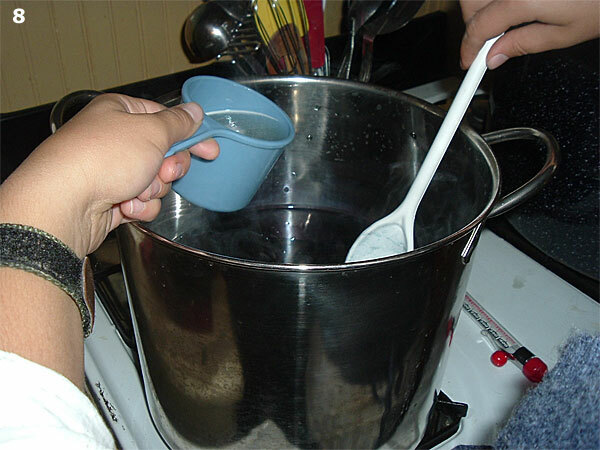 Then pour the fluid back and forth from one container to another (see picture 6). From what I.ve read about indigo dyes, the pigment contains a compound called indoxyl. By pouring it back and forth, the indoxyl reacts with the oxygen in the air and allows the dyebath to turn a very dark blue or almost a black/brown color. 6) The dyebath has one more step before it can be used- it has to be converted from the blue color to a yellow color, which simply means you are removing the oxygen from the dyebath. 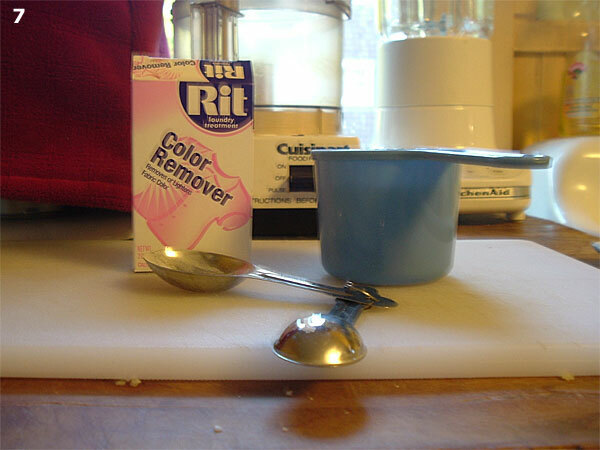 To do this, dissolve 1 ½ T of Rit Color Remover in a cup of water (see picture 7). Slowly add this to the dyebath, so as not to introduce it to more oxygen in the air (see picture 8). Let it stand for 15-45 min. until it has a turned a yellow sort of color (see picture 9). 7) While you are waiting for it to turn, begin soaking the wool in warm water until it is completely saturated (see picture 10). 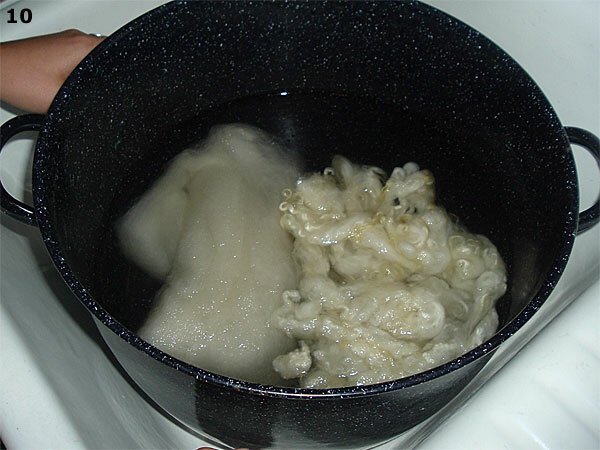 Soaking allows the wool to sink into the dyebath instead of floating to the top. 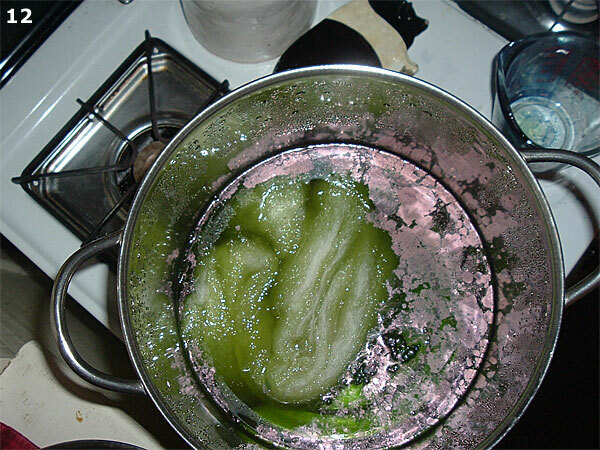 8) Squeeze the water out of the wool and add it to the dyebath (see picture 11). Make sure that it sinks enough below the surface to cover the wool (see picture 12). Cover the pot and let sit for about 20 minutes. 9) Here comes my favorite part! Gently take the wool out of the pot and watch as it oxidizes in the air. 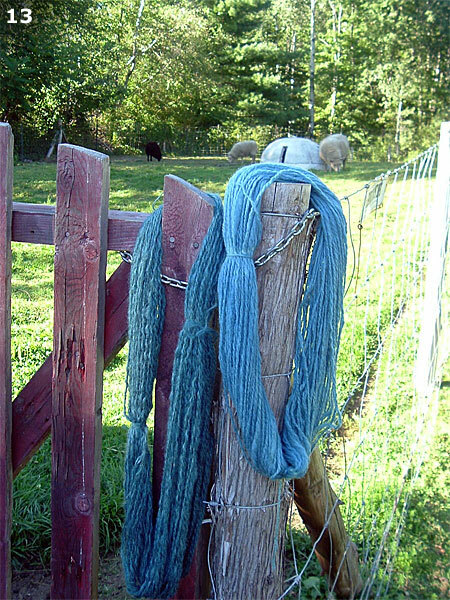 The wool should turn from yellowish green to blue! If you want a darker blue than what you see, simply add another tablespoon of baking soda or ammonia and some more color remover if necessary (in case too much oxygen reached the dyebath) and let the wool soak for another 20 minutes or so. 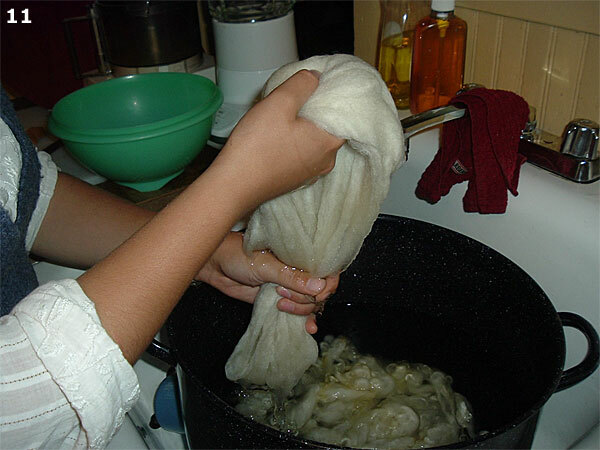 You can continue dyeing undyed wool in this way, as well, until the dyebath is exhausted. 10) When you.ve reached the color blue you like, rinse out the wool in warm water and hang to dry (see picture 13).